Enter the E-mail address of your friend(s) that you wish to invite, You are able to send multiple invitations at once, write your personal message to them and click INVITE. An E-mail invitation will be sent to the recipients and they will be able to sign up directly. Clique Invite people from different areas of your life who share a common interest. 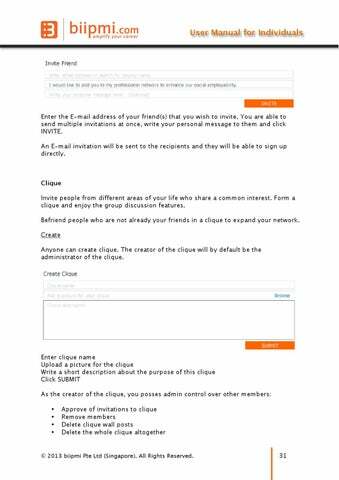 Form a clique and enjoy the group discussion features. Befriend people who are not already your friends in a clique to expand your network. Create Anyone can create clique. The creator of the clique will by default be the administrator of the clique.